Shrub rose of lax arching habit with glossy dark green leaves. 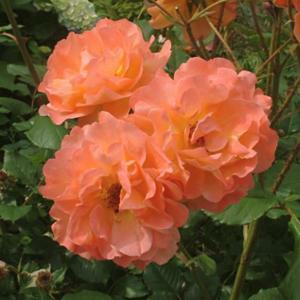 Large clusters of cupped double flowers with ruffled petals, coppery apricot-orange fading to pinkish-orange, repeat flowering from summer to autumn. Lightly fragrant. Fertile, moist, well drained soil in an open sunny position. Tolerates shade and poor soils. Can be trained to grow up a pillar. Raised in Germany, introduced by W. Kordes in 1969.